Knotfest is a music festival created by American heavy metal band Slipknot. The inaugural Knotfest was a two-city event and took place on August 17, 2012 in Council Bluffs, Iowa and August 18, 2012 in Somerset, Wisconsin. Among the line-up were bands such as Deftones, Lamb of God, and Cannibal Corpse. On March 24, 2014, it was officially announced that "Knotfest Japan" would be held in November 15 and 16 at Makuhari Messe, Tokyo. Headliners were Slipknot. Korn, Limp Bizkit, Lamb of God, Five Finger Death Punch, Papa Roach, Bring Me the Horizon, Trivium and In Flames. On the first date of the Mayhem Festival 2014, Knotfest 2014 was announced, with it being held at the San Manuel Amphitheater in San Bernardino, California, on October 24–26. Knotfest 2015 was to be held at the same location, from October 23 through 25. 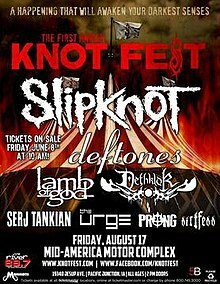 Knotfest was officially announced on June 4, 2012. Among the activities the festival offered as part of its "dark carnival experience" were circus big-top tents, pillars of fire, amusement park rides, burlesque performers, firebreathers, stilt walkers, drum circles made of junkyard cars and graffiti walls. The two shows also debuted a Slipknot museum. "It's all about having fun and going crazy, bringing it to the standard it used to be," Slipknot's Shawn "Clown" Crahan told Rolling Stone. "It's time for us to really engulf this idea known as Knotfest where we're in control, we make a day devoted to our mindset, our ideas, the people that we want to play with, the people that we think our fans want to be around... When everyone leaves their senses [will be] overloaded, and I'm talking about smells, sights, hearing, your body, everything is overloaded with stimulation, because that's what Slipknot does." On July 11, Slipknot announced that their closing performance at Knotfest would be broadcast via a pay-per-view streaming website. Shawn "Clown" Crahan said, "It means everything for everyone to see the live spectacle we're creating in the flesh, but we understand some fans around the world can't be at the show. We've now made it possible for you to be there in spirit - so join us live on August 18." Corey Taylor said on his Twitter "Don't worry, UK: this won't be the last Knotfest..." This suggests there will be more Knotfests in the future, including in the UK. ^ Smith, Jay (2012-06-04). "Slipknot's 'Knotfest' Lineup Revealed". Pollstar. Retrieved 2012-06-13. ^ a b c Baltin, Steve (2012-06-04). "Slipknot to Launch Own Music Festival, Knotfest". Rolling Stone. Retrieved 2012-06-13. ^ Kaufman, Spencer (2014-07-04). "Slipknot Announce 2014 U.S. Knotfest Featuring Danzig, Five Finger Death Punch, Volbeat + More". Loudwire. Retrieved 2014-08-11. ^ a b "Slipknot to pay-per-view stream their Knotfest headline set". NME. 2012-07-11. Retrieved 2012-07-12. ^ Freeman, Phil (2012-06-04). "Slipknot Announce Knotfest'". Roadrunner Records. Retrieved 2012-06-13. ^ Appleford, Steve (2017-11-06). "8 Highlights From Ozzfest Meets Knotfest 2017". Revolver. Retrieved 2018-06-24. ^ "Slipknot announce first ever Knotfest". Kerrang!. 2012-06-06. Retrieved 2012-09-26.